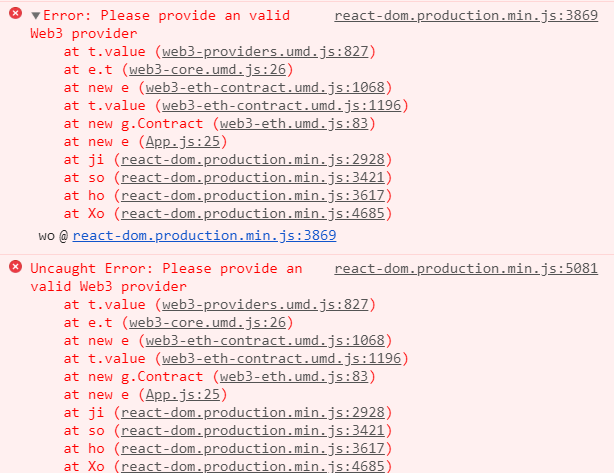 I'm injecting web3 with MetaMask, and everything works, but when I make a production build, I notice that it injects web3 alright, but when I try to call a web3 function, it throws `Please provide an valid Web3 provider'; specifically the error is being thrown when I try to make a contact instance. When I run the development build, everything works fine. But when I make a production build using npm react-scripts build and run it, then I get an error. Browse other questions tagged web3js metamask react or ask your own question.